Is your question about **using** web applications? there is a poll about site themes on Meta SE, maybe very soon could be a SE developer having time to implement these proposals. Is your question about web applications? Is your question about using web applications? Adding using could help to make it clear the kind of questions that are on-topic of this site. Are storefront sites like eBay, Apple App Store and Amazon considered to be “web applications”? Option to migrate to Super User? What flag should be used for customer service questions? 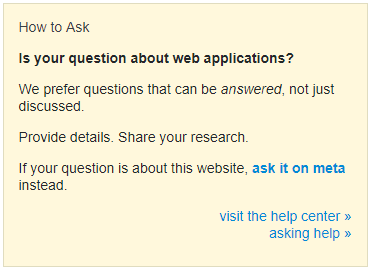 Could we have question warnings on Web Applications?